February 3, 2016 - M.T.H. Electric Trains Authorized Retailers around the country are joining M.T.H. Electric Trains in celebrating DCS National Wi-Fi Day on February 20, 2016. This is make-up event for those M.T.H. Authorized Retailers affected by the giant snowstorm that paralyzed most of the East Coast Friday and Saturday, January 22 and 23. Many of the participating retailers for the January 23rd event that did host the promotion will again participate in the February 20th event. All participating retailers will be demonstrating the all-new MTH Smart Phone App and the the DCS Wi-Fi Interface Unit, providing DCS Software Updates and offering in-store specials and discounts. For months you've been hearing about the wonders of the new MTH app and the benefits of controlling your model railroad with your smartphone or tablet. Now is your chance to see this exciting technology in action for yourself and learn how easy it is to setup and use. Bring your TIU into participating retailers and have it updated with the latest DCS software and pickup the all-new DCS WIU for your layout. 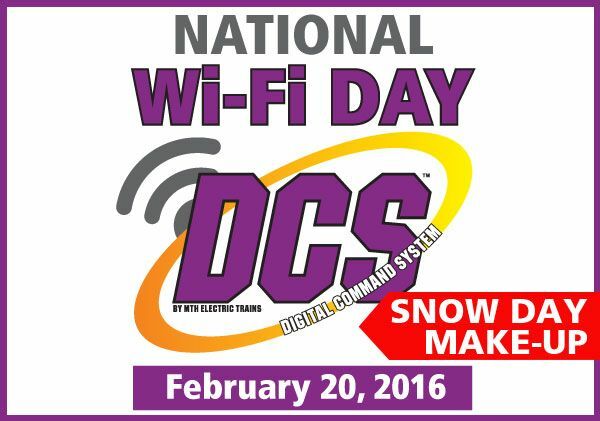 Can't make it to one of the participating retailers on DCS National Wi-Fi Day? Then click on the video link in the upper lefthand corner to see the MTH Smartphone App in action.